Yesterday’s failure of the Doha oil producers meeting will hopefully reintroduce a note of sanity into oil markets. After all, Saudi leaders have made it clear, time and time again, that they were no longer interested in operating a cartel where they take the pain of cutting production, and everyone else gains the benefit of higher prices. As Iran was never scheduled to attend the meeting, surely it was obvious that no deal was possible? The Saudis have also been very clear about why they have adopted this new policy. They recognise that oil, like coal, will end up being left in the ground. So it makes no sense for them, as the world’s lowest-cost producer, to provide a price umbrella that enables higher-cost producers to monetise their oil at Saudi’s expense. Despite these clear statements, oil prices have rallied 50% since January. But lets be clear. This move was never based on the improbable idea that a production freeze by Russia and some OPEC members (excluding Iran and probably Iraq), would somehow change today’s 2mbd surplus of oil into a more balanced market. In reality, the real story has been buying of oil market futures by financial speculators. But as the futures market data showed then, the smart traders were already banking their profits and moving on to new opportunities. The Doha story had done its job, as far as they were concerned. And they knew that in a weak market, profits come from “buying on the rumour, selling on the news”. It is very difficult to make money over the medium to long-term if everyone has already had the same idea. But one doesn’t need to be brave to simply follow the crowd and do what everyone else has already done. This, of course, is a key reason why many investors and companies invest at market peaks, and don’t invest at market bottoms. This pattern has become more extreme since the vast central bank stimulus programmes began in 2009. Companies and investors were convinced that policymakers had become all-wise and far-seeing. So they only needed to read central bank statements in order to know what would happen next. Last week also saw investors start to lose faith in the US Federal Reserve. It has constantly told investors that the US economy was recovering and that interest rates would increase this year. But now it has failed to act either in June and September. Naturally, investors are starting to worry about whether the Fed knows what it is doing. And the last scenario turned out to be what happened. So suddenly, investors began to worry about how they could have been so wrong. In turn, this led to concern about how the market is currently valuing different assets. If the Fed doesn’t know what it is doing, and the economy is weaker than it expected, then have investors overpaid when buying at peak consensus sentiment levels? This is a worrying thought. It also highlights the rocky road ahead as the Great Unwinding continues. Investors now have to start to re-learn how to form judgments for themselves about the fundamentals of supply and demand, and suitable valuations for these. They can’t just trust the Fed, buy Exchange Traded Funds, and sit back to wait for the profits to roll in. As we have seen in China, once confidence is lost in the markets, they can become chaotic very quickly. 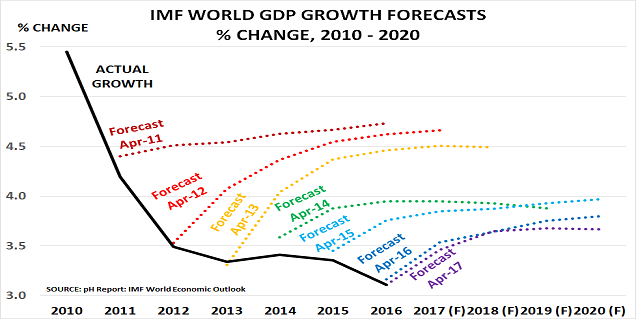 As readers will know, I have consistently argued that the central banks were guilty of wishful thinking, with their idea that printing money could somehow stimulate growth in an ageing population. So it is good to know they recognise there might be some truth in the argument. Thus Japan has simply run out of realistic options for growth. Its population is now set for steady decline from 2010′s level of 127m to just 108m by 2050, according to UN Population Division forecasts. We also know, again from Statistics Japan data, that spending peaks in the 25 – 54 age group, as the second chart shows. After this, people already own most of what they need, and their incomes decline as they enter retirement. These spending patterns also matter for the economy, as consumption is around 60% of Japan’s GDP. Japan has one of the oldest populations in the world, with a quarter aged over 65 years. Therefore it really is wishful thinking of the first order to imagine that it can possibly return to the growth levels seen when its BabyBoom was in its peak spending mode . After all, the youngest Boomer, born in 1952, is now 63 years old. The great moral of ‘Peter Pan’ is that children have to grow up and join an adult world. They cannot live in the magic world of Neverland forever. What a pity that Japan’s policymakers obviously never read to the end of the story. Of course, if you hand out Yen 80tn/year ($480bn) in stimulus, as the BoJ is now doing, and devalue 50% versus the dollar, you will get a short-term jump in the growth rate. 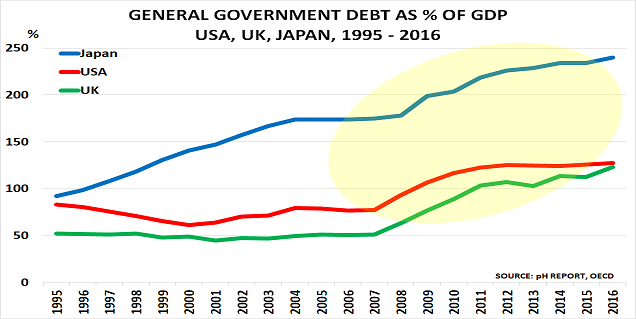 But then the rate will fall back again, as Japan’s working age population has to pay for the cost of this short-term stimulus through higher taxes. The greatest pity is that premier Abe chose to ignore the wisdom of the BoJ’s previous Governor, Masaaki Shirakawa. He understood all too well that demographics are far more powerful than monetary policy.